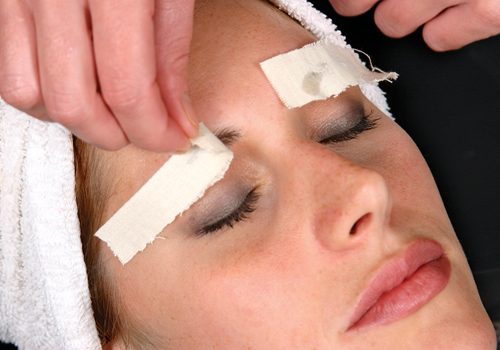 Waxing eyebrows – a quick and easy way to hair removal, after which the eyebrows retain their shape for a long time. This is perfect for girls with thick eyebrows. The biggest advantage of eyebrow waxing hair removal is that you can pull out several unwanted hairs and not waste time on each hair. However, this method is more painful. Get them done by a professional instead of doing it yourself is the easiest way to ensure you get them off easily. Waxing is a temporary method of hair removal which removes the hair from the root. Waxing involves spreading hot wax on the area targeted for hair removal, putting a strip of cloth over the wax, rub vigorously and then rip cloth – along with the wax and hair – in a smooth movement. This technique removes the hair and is generally considered to be more durable than plucking (the roots take several weeks to re-establish). While this is painful, the method takes only seconds and the pain disappears quickly once you get accustomed to the method. Heat the wax and apply them on strips. Stick the strips on to the desired area and try to put it in the direction of hair growth. In this case, to separate the hair you can use a toothpick. Apply wax accurately and to control the process, do not take a lot of wax. Place the strip in the direction of hair growth, not sticking the tip (if the hairs grow from left to right - leave the tip of the strip on the right). Tap and drag on the strip in the direction of hair growth in a few times to make sure that the wax is pushed to the hairs. Grasp the edge of the strip. Hold the skin with one hand and lift the strip against the direction of hair with a jerk. Tighten the lid tightly and remove the strip against the hair growth. Strip between the eyebrows to pull downward. Repeat the process as long as all the unwanted hairs are removed, and you will attain the desired eyebrows shape.